Not going to lie, summer has been wearing on me a bit. It's not just having the girls home, or the heat, or the change to my usual routine. Nope. Rather, it's having my quiet alone time every day almost completely wiped out. As an introvert at heart, I need (really and truly NEED) alone time every day to come back to myself. I think being a stay-at-home mom for so long has dramatically increased the amount of alone time I need to feel sane! Fortunately this summer has been extra amazing so far, and despite not having as much me-time as I desire, I have been enjoying being home with the girls and doing activities with them. There is no where near as much bickering or fighting as there has been in past summers. Hooray! But on Tuesday I finally got to steal away for a few hours. All by myself! One girl was at day camp, the other girl was off with her grandparents. Ahhhh, six whole hours to fill. I eschewed chores and errands and instead spent most of my day focusing on getting in a run in the mountains. It took me a while to get out of the house: there was an episode of The Bachelorette to catch up on, you see, then I packed up my gear and jumped in the car. Unfortunately what should have been about a 30 min drive to the Snoqualmie Point trail head turned in to more like an hour. Ugh. Traffic was bad. Then I went to the wrong trail head because I remembered the directions wrong from the WTA website. No mind, I finally, finally figured it out then pulled in to the parking lot and set out on my run. One other thing of note: there are two parking lots here. One for Snoqulamie Point Park, which has 2 hour parking, and another that appears to have no time limit. The no limit lot is right next to the trailhead. If you park in the 2 hour lot, take the gravel path over to the other lot and the trailhead. 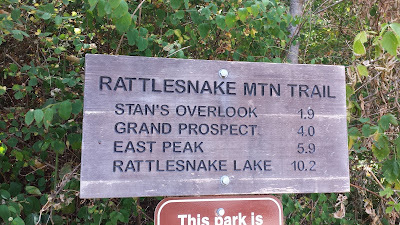 I knew Rattlesnake Mountain was, well, a mountain, but I didn't exactly know the elevation profile. Well, it was almost straight up until the turn-around. Not drastically so (just over 2,000 ft in 4 miles), but still almost totally un-runnable for me. I was practically gasping for breath even quickly hiking! It was frustrating, I felt like I was totally out of shape. 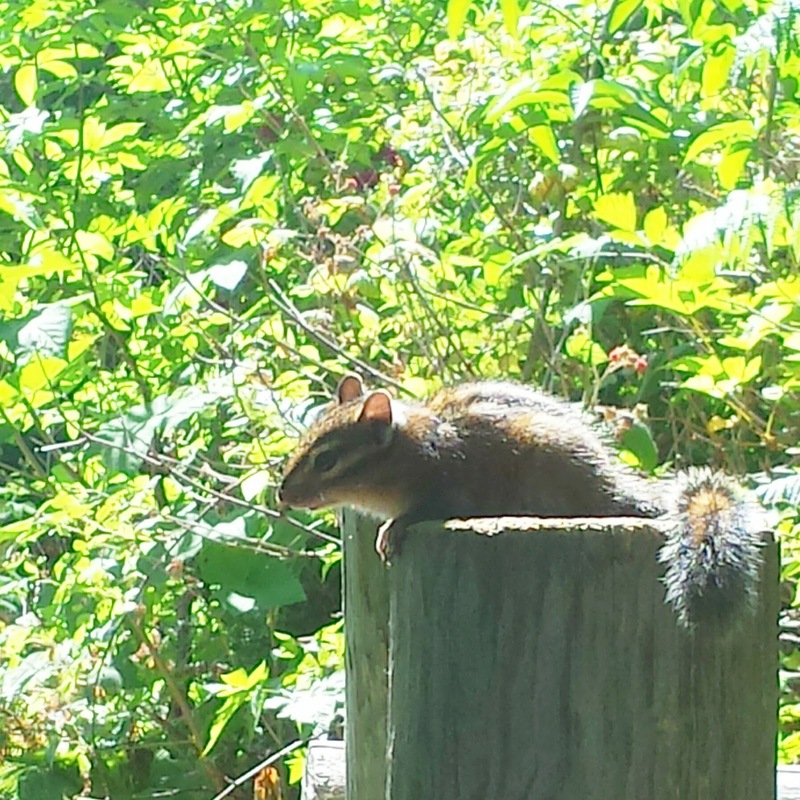 Met this little guy on one of the posts on the trail. 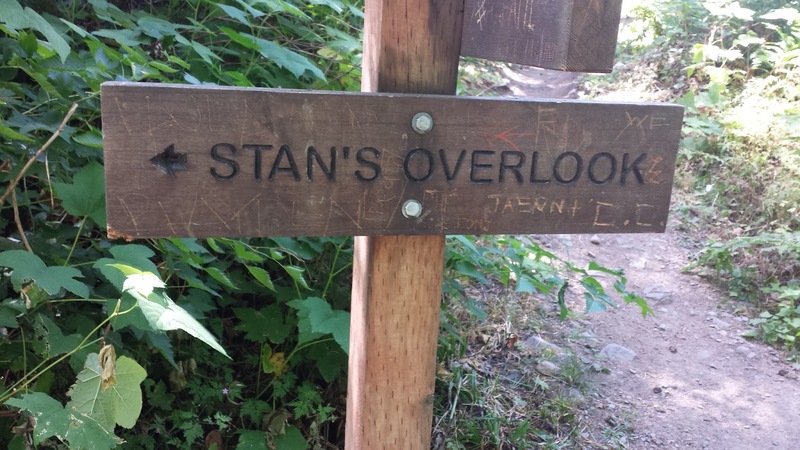 My first stop was Stan's Overlook. It was a beautiful view over the North Bend area! Fortunately once I got to the Grand Prospect viewpoint (4.25 miles in about an hour fifteen) it was then downhill the whole way back. I didn't stop at all on the way down and it only took me 45 minutes. View from Grand Prospect overlook. I don't know what that peak is, but thinking maybe Mt. Si? All in all I was out there just over 2 hours. It ended up being a perfect little solo weekday adventure. I highly recommend checking out Rattlesnake Mountain. The trail is extremely well-marked and is just a straight shot. You'd have to work pretty hard to get off track up there! 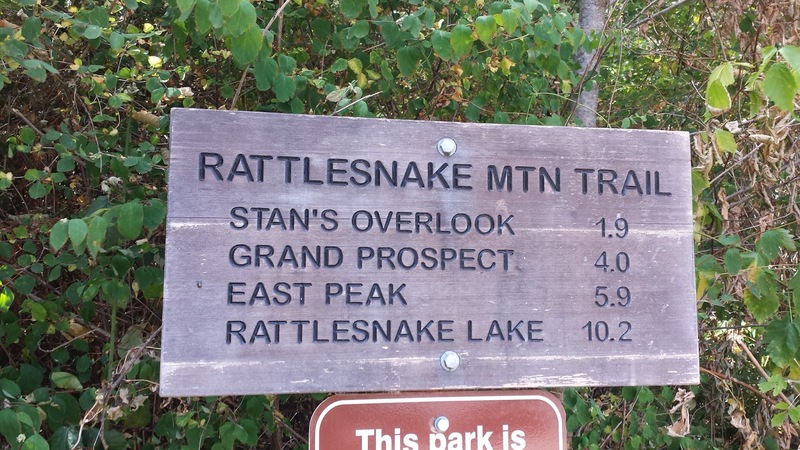 Some day I want to take a friend to do a car shuttle so we can run from the Snoqualmie Point trailhead to Rattlesnake Lake on the Rattlesnake Mountain trail, which is 10 miles one way. Or who knows, get crazy and run there and back for a 50k training run . . . hmmm . . . This run was a good little training run for a big adventure this weekend! I am once again hopping in to plans some awesome trail running ladies have made, this time for a run at Mt. Rainier. So. Incredibly. Excited. Look for a post on that next week!